International Congress of Oral Implantologists (ICOI) is an international association of implantologists. It is the largest, and also the oldest non-profit association in the world, which was founded in the early 70s of the twentieth century. The main aim of the ICOI is the improvement of the qualifications of implantologists working all over the world. What is more, it also encourages doctors to do a research in the field of implantology. ICOI organizes training courses, seminars and courses, during which a variety of clinical cases are analyzed and discussed, with the focus on how to solve the problem taking into account the latest developments in implant dentistry. ICOI also brings together surgeons, dental technicians, and dental equipment manufacturers. To become a member of the ICOI, it is necessary to successfully pass an exam success in implant dentistry. Dentists in Perfect Smile Dental Clinic are the members of ICOI. 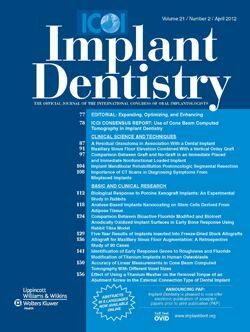 ICOI also organizes many congresses with the participation of the most eminent specialists and researchers from all around the world, moreover, it publishes a quarterly magazine Implant Dentistry.